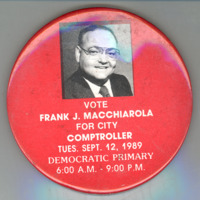 A red button from Dr. Macchiarola's campaign for the Democratic Primary for NYC Comptroller. 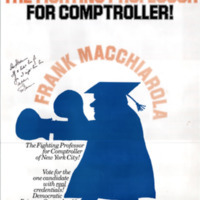 Button Text: "Vote Frank J. Macchiarola for City Comptroller Tues, Sept. 12, 1989 Democratic Primary 6:00 A.M. - 9:00 P.M.
A poster from Dr. Macchiarola's 1989 campaign for the Democratic Primary for NYC Comptroller. Handwritten autograph reads: "For Steven, If it hadn't been for you, I might have been elected. Frank." 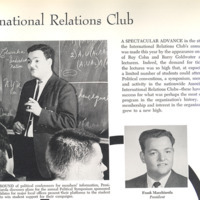 Dr. Macchiarola in his junior year, as President of the I.R.C. (International Relations Club) he discusses plans for the Annual Political Symposium.